A few comments worth sharing from their most recent investor conference call. Management says the business is "solidly profitable", $50 million in profit, 10% pre-tax. Nice results in a gloomy environment. Not everybody is failing. About 10% of the salaried workforce were downsized. "We are significantly downsizing our Home and Childrens gift business segments including reductions in catalog marketing (see page 2 of the document) ..."
Kudos to the 1-800-Flowers Database Marketing Team!!! It isn't often you hear figures quoted in these calls. 1,000,000 new customers during the holiday period, 57% of orders from repeat customers (not how I prefer to calculate this metric, but so what!) , and 30,000,000 customers in the database. This tells me that this business is probably in Acquisition Mode --- that may sound strange, but with 30,000,000 customers in the database, they should be pulling in 80% of orders from repeat buyers if they had better customer loyalty. Comment From Joseph Pititto: "I think on the marketing channels the least productive channel we have is catalog marketing especially on the prospecting side." Our job, as industry leaders, is to synthesize all of the feedback we're getting from business leaders. The vendor community continues to advocate multichannel marketing via catalogs. Business leaders continue to shut down catalog marketing efforts, clearly telling the world that catalog prospecting is dying. Every one of us should have a five year customer acquisition plan that migrates us out of the co-ops (if performance warrants) and catalog prospecting (if other avenues can be developed) during the five year period. This plan requires considerable testing of alternate ideas over the next eighteen months, in order to keep us moving ahead of this trend. You may have heard me be critical of the co-ops. One place where co-ops deserve praise is in the targeting and modeling they've done over the past two years. Long-term value of customers acquired via co-ops have consistently been above-average, after seeing very different results in the past. Whether competition or better algorithms or better data capture, the result is highly positive. Often, subsequent merchandise purchased by co-op customers is different, and subsequent channels purchased from by the customer are different than the merchandise/channels purchased by online customers using algorithms like Google. Also pay attention to Zip Code Forensics --- a few of the larger co-ops skew heavily toward Catalog Crazies & Catalog Fans, not good, not bad, just means they are going after the rural catalog customer, directly or indirectly. Conversely --- Google --- those customers skew to the Online Bliss and Online Spend segments in Zip Code Forensics. This wasn't hard to predict. It is sooooo easy to say that things look bad. Find the individual who says things are going to improve, and shows you a path out. That person may be wrong, but she has the courage to stick her neck out there. If you can't find that person, BE that person! In basketball, when things look bad during a game, you call a time out and regroup. You don't fire the team during the game. So call a time out. On Data Analyst Day (February 2), celebrate all that is still good about working in our profession. Then come back to work on February 3, and start putting some positive mojo out there --- no matter what anybody says, no matter how many jobs are lost, you're going to fix your corner of the world. And if enough of us do that, things will improve. In our world, we've heard the phrase "Multichannel customers are the best customers" for about a dozen years. This phrase is used by retail and catalog CEOs, by consultants, and especially by the vendor community. It is frequently used as the reason for implementing various marketing strategies, opening stores, or for purchasing software systems. It is sort of like telling somebody to buy an oven because really good food comes out of the oven --- not understanding all of the dynamics that go into making and baking good food. The multichannel metric is an easy one to calculate. Folks will filter only the twelve month buyer file, and will query that file, summing past demand based on past physical channels (phone, web, stores) purchased from. Others calculate the metric in a "forward looking" way, measuring twelve-month future spend as a function of past channels. Here's an example, using aggregated and dummied-up multichannel data. 1 Channel In The Past = $169 in the future. 2 Channels In The Past = $226 in the future. 3 Channels In The Past = $362 in the future. So, we've proven the statement, right? Well, there's another way to validate the information. We can build models --- Logistic Regression for the repurchase rate, Ordinary Least Squares for spend per repurchaser. In this example, I built models using numerous variables for a traditional business that has three physical channels. Square Root Of Months Since Last Purchase. Purchases In The Past 12 Months. Is Customer An E-Mail Subscriber? 1 = Yes, 0 = No. Number Of Physical Channels Customer Purchased From. Number Of Online Channels Purchased From (Paid Search, Affiliates, Natural Search, Blogs, Shopping Comparison Sites, Portal Advertising, etc.). Square Root Of Catalogs Mailed In Subsequent Twelve Months. Orders Past 12 Months = 0.324, Wald Statistic = 2800. Square Root Of Subsequent Catalogs Mailed = 0.293, Wald Statistic = 1800. Orders 13+ Months Ago = 0.084, Wald Statistic = 1300. Square Root Of Recency = -0.187, Wald Statistic = 720. Number Of Merchandise Divisions Purchased From = 0.049, Wald Statistic = 200. Number Of Web Advertising Channels Purchased From = -0.073, Wald Statistic = 100. E-Mail Subscriber = 0.110, Wald Statistic = 65. Physical Channels Purchased From = -0.070, Wald Statistic = 40. And here's the Ordinary Least Squares Regression Coefficients, and T-Statistics. Average Order Value = 1.343, t = 87. Number Of Twelve Month Orders = 73.483, t = 77. Number Of 13+ Month Orders = 6.384, t = 25. Number Of Web Advertising Channels Purchased From = -18.483, t = -15. Square Root Of Subsequent Catalogs Mailed = 14.395, t = 13. E-Mail Subscriber = 28.548, t = 8. Now, the statisticians out there will start "nibbling on the cookie", trying to pick apart all of the problems they see with the modeling strategy and variable definition. Go ahead, pick away. The CEO will want to understand the strategic implications of the model results. What did we learn? Traditional RFM variables are the most important variables. We want recent customers who order frequently and spend a lot each time they order. Traditional catalogers would say "duh", but this is news for many web analysts and e-mail gurus and e-commerce leaders. An entire set of KPIs can be developed to understand if the business is evolving in a favorable manner. Catalog mailings are important, but have a diminishing rate of return as they are mailed, meaning each additional catalog is less and less important. Merchandise divisions are somewhat important. You want a customer who purchases DVD players and LCD televisions --- that is more important than having a customer who buys just iPods. Notice that the coefficient is "small", meaning it isn't nearly as important as having customers who purchase multiple times. Physical channels have a negative coefficient. In other words, after controlling for RFM factors, having multichannel customers means nothing, in fact, it is negative! E-mail is interesting --- e-mail as a program has the same value as getting a customer to purchase about 1/3 of an order --- so e-mail doesn't have a huge amount of value. Now in the spending model, e-mail adds $29 of value, so that is good. Here's the thing, folks. Take your twelve month audience, and for each subscriber, plug the customer data into the model. Sum, across all customers, total 12 month future value due to e-mail marketing, and compare that with the demand your e-mail reporting system told you that you generated over the past twelve months for customers who were twelve month buyers at this time last year. Do the numbers tie out? They shouldn't. The model coefficients, if derived properly, are going to be more accurate at communicating true e-mail value than the open-rate, click-through-rate, conversion-rate metrics everybody is taught to look at. Web advertising channels are negative --- in this case, you don't want a customer buying because of paid search and affiliates and portal advertising. These customers might be doing too much comparison shopping and won't build long-term loyalty the same way as other customers do. 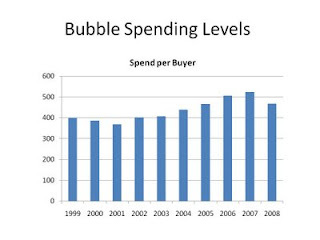 Similar trends happen in the spending model. You see, we don't always need to build models for targeting purposes. We build models for strategic purposes, for communicating to CEOs, for determining a marketing strategy. And the models frequently debunk established best practices, don't they? This data suggests it is more important to get customers to buy from multiple merchandise divisions than from multiple channels. So why not focus on revamping an e-mail marketing program by offering multiple merchandise divisions in the creative template you are using? Why not focus on landing pages that offer multiple merchandise divisions? This data suggests that catalog marketing has a point of diminishing returns. Why not test the appropriate number of catalogs to send to different customer segments? This data suggests that customers age rapidly --- orders 13+ months ago are worth maybe 15% or 20% as much as recent orders --- and response decreases as months since last purchase increase. So when you have a customer who hasn't purchased in six months, think strategically about how you re-engage that customer --- or let the customer go and acquire a new one. This data suggests that physical channels ultimately have little meaning --- you don't care if the customer buys online and in stores --- you need to care about what the customer is buying, not the channel they are buying it from. Now channels may have importance if you cannot acquire customers in the catalog/phone channel that you currently acquire online. It's important to understand these dynamics --- and these are dynamics we seldom talk about. Strategy, as outlined in this article, is sorely missing from multichannel marketing. We don't instruct our statisticians, if we're blessed enough to be able to afford one, to create strategic models. And we sure don't lead our co-ops, who have these answers and many, many more answers embedded in their databases --- we don't demand answers from them, we just pay them for access to inexpensive prospects. The large web analytics vendors can help us with this as well. The title of this post is "False Metrics". We are surrounded by false metrics. "The open rate of the e-mail was 19%, therefore, it failed". "Our website conversion rate increased to 4.04383%, so we're doing better". "Multichannel customers are the best customers". "The matchback algorithm says catalogs drive 80% of web sales, so catalogs matter." "Paid search isn't working, but a lot of catalog buyers seem to be using it." We'll move our industry forward when we start focusing on strategic analyses that parse customer data into understandable and actionable components. Anonymous recently left us a comment. He mentioned that he formerly worked for a Big Box Retailer, and is now applying for e-commerce merchant jobs, without success. The e-commerce folks want a merchant with e-commerce experience. Another person named Anonymous responded to our article about "The End Of An Era In Catalog Marketing". When asked why nobody commented on the article, this individual said "How do we begin to imagine changing our business model in the midst of such uncertain economic times? How can we be certain that the 'new' methods we need to develop will outperform the dying model we prefer to cling to? I guess we would rather sink slowly than jump into a whole new boat." Ok, you're a catalog person --- or a former retailer. The world changed. You used to work on important offline issues, generating demand that made the e-commerce people look brilliant. Now you are scorned by eco-friendly types, your marketing efforts are 2/3 as productive as they were five years ago, the USPS hammered you two years ago --- accelerating the free fall, the e-commerce folks have shut you out, and your company is shedding jobs right and left. This trend repeats itself, over and over again. The credit card and contact center combined to end sending orders to the brand via the mail. Targeted, 80 page specialty catalogs nibbled the edges off of the 600 page Spiegel, Wards, or JCP catalog, ending that business model. E-commerce is in the process of ending catalog marketing as we know it. And some day, Hologram Marketing will destroy e-commerce --- we'll view e-commerce websites as quaint artifacts --- the e-commerce folks will tell us that paid search and e-commerce combine with hologram marketing to form a multichannel "solution" that most valuable customers adore. Search marketing will implode while a new service provides us with real-time search via a hologram personality right in our own home. Ok, you're a catalog person. What do you do today? Others struggle with these concepts in the music industry. And the issue is more dire, more immediate, in the newspaper industry. First of all, the catalog industry isn't going to die next month ... or next year. There will be a niche for the next ten or fifteen years that supports the rural customer living in Vermont or Wyoming. And if you're willing to ride that wave, go right ahead, there's nothing wrong with that. Maybe you're like me. You're in your early 40s, and you're realistic about the fact that you have a 30 year career ahead of you without the promise of a viable Social Security program or a 401k swelling from the myriad benefits of an ownership society. And the same dot.commers who we watched implode in the late 1990s now refuse to hire us in 2009 because we're considered "old school". For this individual, there are challenges and opportunities. You can take a step back, and learn e-commerce from the bottom-up. Maybe you give up the Director or Manager title for a Manager/Analyst title, and you learn. Or you can "sidestep" e-commerce. That's what I did. I was mocked by the e-commerce folks for being "old school". Once it became obvious to me that cataloging was dying, back in 2002, I worked hard, developing skills that apply to any "channel". Multichannel Forensics was actually created in 2003 and applied in real-time at Nordstrom in 2004. The key elements of the methodology were documented in a book written in 2005. A blog was started in 2006, the Multichannel Forensics book was available in 2007, a consulting practice started in 2007, and the whole thing is now sustainable in 2009, even though many in the catalog establishment criticize it and many in the e-commerce establishment don't understand it. In other words, you create a plan, and you adapt the plan as times change. And by having a plan, your future is sustainable. For me, it became obvious that you don't beat e-commerce, you don't force a dying business model down the throats of others, and you don't force those who are loyal to a dying business model to change. You simply move sideways. At Nordstrom, I was outside of the e-commerce ecosystem. My skills weren't relevant. So I had to find skills that mattered. Forecasting the future mattered. Social media, while not a sales driver, mattered as a new skill set. Understanding customer behavior mattered. Measuring ROI mattered. Combine all of those skills, and you've got The MineThatData Blog, you've got Multichannel Forensics. You've got something that catalogers and e-commerce brands and retailers and social network businesses can use. Ok, you're a catalog person. It's not all gloom and doom. Ride catalog marketing as far as you can. Or start developing your e-commerce skills, or build your social media skills. Or start testing micro-channels like there is no tomorrow. Or invent hologram marketing, or build mobile marketing from scratch. Don't be worried or frightened. Have a plan. And adapt as the industry adapts. I wrote earlier in the week about what I felt was an odd image in a Lands' End e-mail campaign. A reader forwarded a YouTube video from the photo shoot where the image came from. The video is embedded below. We'll assume that the image is real. Thank you, readers, for providing "checks and balances". One of the pieces missing from our multichannel analytics and web analytics toolkit is the Comparable Segment Analysis. Here's a common way to run the analysis. Create a segment of customers with similar performance --- maybe all customers who purchased three or more times in the past twelve months. Isolate these customers --- 3x buyers from 12/1/2007 to 11/30/2008. Measure performance in the next thirty days --- repurchase rates and spend rates during the month of December, for all customers in this segment during the past twelve months. Repeat the analysis by moving all dates back twelve months. Then repeat again, and again, and again, going back as far as you have data to replicate the analysis. 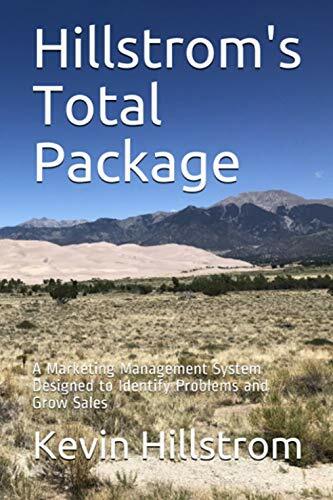 This analysis allows you to see how a core group of good customers are performing --- similar to the retail same store sales metric, but applicable to your typical direct-to-consumer or e-commerce channel. This analysis is important, because it helps you understand just how much your loyal customers are spending, compared with prior years. You'll know how much the "economy" is hurting your business, independent of your reactivation and customer acquisition strategies, independent of channel shift. Most important, you'll truly know when your business is starting to recover. Prior to the Iraq War, business performance moved in cycles. Every 3-4 years, new highs or new lows were recorded. Both Lands' End and Eddie Bauer moved in similar cycles. 1992 - 1993 were good years. 1994 didn't meet expectations, followed by a lousy 1995. 1996 was good, 1997 was good for awhile, followed by a horrible 1998, and a better 1999. Then the dot.com bubble popped in 2000, and 9/11 took a bite out of 2001, with the corresponding recession lasting into 2002. In other words, there were ups and downs, not predictable, but cyclical. Cycles keep us humble. We were never more than a few years away from a downturn, we remembered the lessons of the last downturn. 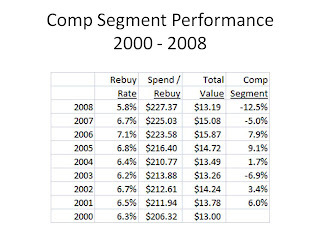 Now take a look at Nordstrom performance, from 2003 - 2007. You don't see a cycle, do you? In fact, you see unbridled success, a meteoric rise into the stratosphere. Online, the trends were even more dramatic --- online, we could do no wrong, we were brilliant! Maybe the reason this recession is going to be so severe is because we have to correct for more uninterrupted years of success than we corrected for in the past. One thing is certain. We are re-learning the importance of business fundamentals. Businesses don't succeed because they have a brilliant social media strategy, or because they embraced mobile marketing, or because television ads are funny. Businesses succeed when inventory is managed so well that there are few markdowns to be had during a downturn.. Businesses succeed when capital expenses are proportionate to conservative forecasts of profit. Businesses succeed when profits are reinvested, as opposed to borrowing in anticipation of future business success. Businesses succeed when advertising and marketing dollars are viewed as scarce resources, not as a budget line derived by multiplying net sales by 0.20. We're going to be in much better shape, once the scars of this recession heal. Humble marketers are smart marketers. It turns out that I created a unique lab experiment this week. I wrote three articles that have varying levels of importance. Strategic Importance And Profit Importance: The End Of An Era In Catalog Marketing. Profit Importance: Zip Code Forensics, Version 2 Is Free And Now Available. Simple Attention To Detail: Creative And E-Mail, When Did We Stop Caring? Based on RSS readership stats, site stats, clicks, and comments, here is the rank-ordering of what you interacted with. Regarding e-mail, you loved clicking through the link, you wanted to see what I was talking about. Then you told me to get back on topic, you defended the notion that the foot did touch, you defended the artificial match of images via software --- a match creating a false version of reality, and you stated that this won't impact sales at all. You interacted with the article, you thought about the implications, you formulated opinions, and you openly criticized me. When given an opportunity to learn about a free way to make your business more money. you interacted much less with the content. Who wants to ignore making additional profit at no cost? Apparently a lot of us! And when offered the opportunity to consider one of the most important strategic topics of our time in catalog marketing, we were completely silent. Why? What is important to us? Explain this inverse relationship by leaving a comment below. I welcome all of the companies that volunteered anonymous zip code sales data during the past three months. 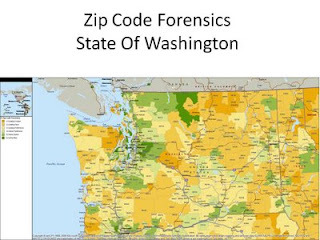 Your contributions result in an improved version of B2C Zip Code Forensics! If you are interested in participating in Zip Code Forensics, at no cost, please download the following documents. A Graphical Representation Of Version 2 Of Zip Code Forensics. Spreadsheet With The Actual Segment Assignments For The State Of Washington. And by the way, what do you notice about urban/suburban/rural zips in Washington? Most of the Seattle/Tacoma and Spokane area is green (e-commerce). Most of the zips in the Cascades and Rockies (rural) are orange (catalog focused). Keep thinking about this urban/suburban/rural thing, and the place for catalogs in the future of direct marketing. Test results from our participants indicate that if a cataloger only mails the Catalog Crazies and Online Bliss segments, the quantity in the RFM segment or outside list will be reduced by about 75%, with improvements in performance of between 7% and 20%. There aren't many folks offering you the ability to improve your marketing efforts at no cost --- and the algorithm suggests that the more participants we get, the better the algorithm performs! So join us ... contact me for information on how to participate, for free! And B2B marketers --- we're very close to having a version of Zip Code Forensics that works in a reliable way for your channel. We need a few more participants to make this work well! Catalog Crazies: The most productive traditional direct marketing zip codes. Catalog Fans: Average performing traditional direct marketing zips. Catalog Preference: Marginal performing traditional direct marketing zips. Online Preference: Marginal performing e-commerce zips. Online Spend: Average performing e-commerce zips. Online Bliss: The most productive e-commerce zips. Creative And E-Mail: When Did We Stop Caring? Look at the right foot of the male in this e-mail marketing message ... it is not touching the platform he is standing on. Honestly, I am no better. I have typos and grammar errors on my blog, all the time. We fail the customer when we're sloppy. Pay attention to the small print toward the end of this argument about internet sales tax collection. While it is important to consider the issues with internet sales tax (issues that are largely meaningless, because customer behavior doesn't fundamentally change as sales tax is added), it is so much more interesting to consider that Overstock.com had 3,400 affiliates in New York State!! You're probably looking at, what, 30,000 to 50,000 affiliates in total, nationwide, at Overstock? This is what I mean when I talk about micro-channels. It is easy to go to Abacus and ask for one-time access to 1,000,000 households that yield you 8,000 new customers after matchback. It is hard work to manage 40,000 affiliates that will drive 8,000 new customers to your brand. You'll quickly note that this style of marketing "doesn't work --- half of your affiliates wouldn't generate any new customers over a two month period of time"! And yet, each method generates the same result. Results are all that matter. Our future is an endless array of 200,000 micro-channels that yield one or two or three or seven-hundred new customers a year. There will simply be too much competition to leverage Google effectively, and all of the old-school mass-audience methods are slowly dying. It is nice not to be the only person out there (thanks Mr. Rimm-Kaufman) willing to publicly state the obvious ... that catalog customer acquisition is nearing the end of an era. Even the best conferences aren't covering this important topic. The Spring 2009 NEMOA Conference. features a talk from REI guru Mike Bowcut on "Why Catalogs Still Belong In The Toolbox". Certainly, you'll learn something valuable from this talk. Mike is brilliant, his discussion won't lead you astray. Catalog Customer Acquisition is dying. Catalog brands with strong retail channels have loyal multichannel buyers who no longer generate any incremental volume when a plethora of catalogs are mailed to them --- the "organic demand" concept we observed at Nordstrom back in the first half of this decade. Combined, these two trends represent the giant red blinking lights we see as we approach a railroad crossing. We are being given unmistakable warning signs that change is coming. Why won't our best and brightest talk publicly about these issues? Analyze your data from fourth quarter, for the past ten years. Take a look at customer acquisition productivity, using your matchback analytics, combining data across all channels. You're going to see productivity declines of between twenty and seventy percent over the past ten years. Heck, when Google generates 32 billion searches a month compared with 2 billion searches a month just four years ago (and zero more than a decade ago), we know the world is changing ... dramatically changing! Why aren't we asking strategic questions? If catalog customer acquisition is dying, and the majority of our new customers come from catalog customer acquisition, how will we acquire new customers in five years? If the soul of our organization is built around catalog marketing, what does this mean for the soul of our organization? What kind of talent do we need to meet the future marketing needs of our business? How are online pureplays acquiring new customers --- how does Zappos do it? How does Amazon do it? How does the $10 million dollar online business down the street do it? What can we learn from others? When can we schedule a field trip to visit the online pureplay? If we have a retail channel, and customers are not spending incremental revenue in spite of catalog marketing, why do we have a catalog marketing channel? If rural customers still require catalog marketing, but urban/suburban catalogs no longer need catalog marketing, how do we configure a contact strategy that meets the needs of a significantly smaller universe of shoppers? And how does this new catalog contact strategy impact merchandising, creative, and inventory staffers? What is the future of the co-op brand, brands that ran list rental organizations out of business on the basis of cheap, targeted customer acquisition names? These brands will undoubtedly provide significant future value to your business, right? But how? Are we working with them to map out our future? Since a portion of our country is embracing "change", it might be helpful for all of us in the multichannel retailing industry to embrace change as well. This is a map of the Northern Great Plains and Northern Rocky Mountain states. Orange zip codes represent customers who are responsive to traditional direct marketing. Green zip codes represent customers who shop via e-commerce. 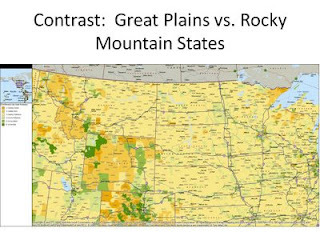 Notice the big difference between the Great Plains states and the Rocky Mountain states! We have a lot of marketing challenges in the future, given that so much of marketing is becoming "pull" marketing (the customer pulls the information they want, using the channels they wish to use). One of the advantages we have is data. We control what we push, and we don't have to push something to an individual who doesn't want information pushed to them. If we want to test a new merchandise line in an e-mail campaign, there's no reason we couldn't select the "green zip codes" in the map above, coupled with responsive e-mail subscribers who have a propensity for the merchandise we're sharing with the customer. We don't have to annoy the customer in North Dakota. Take advantage of geography --- it is going to be a part of our multchannel, multi-platform future. We're being asked to reduce marketing expense in 2009. A current best practice is to calculate lifetime value. Customers with sufficient "LTV" receive outbound marketing, while customers with low "LTV" are not targeted with outbound marketing. This year, the process is changing. We're being asked to not only forecast lifetime value, we're being asked to identify customers who experience lifetime value reductions because of our actions. This sounds odd, but it really isn't an unusual concept. In the past, we'd identify a 13-24 month customer who loses $10.00 per order, and has $5.00 of LTV. This customer would be suppressed from subsequent campaigns because net LTV is -$5.00. 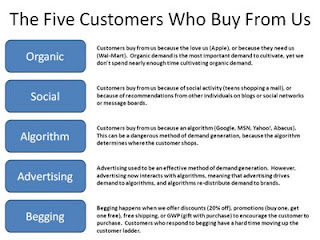 In 2009, we need to identify the customers who are likely to generate "organic demand" in the future. Amazingly, these customers can experience lifetime value reductions if we market to them, because the customer was going to purchase merchandise anyway. The majority of CEOs working on Multichannel Forensics projects are asking me to identify organic customers. This is becoming an important part of the marketing process. For the Statistical Modeler, this represents yet another "offshore drilling" opportunity --- a chance to work on something unique and new. 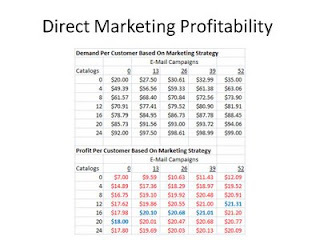 For the Catalog Marketer, this is a chance to reduce expense while not harming the top line. For the E-Mail Marketer, this is a golden opportunity to reduce contacts to customers likely to order anyway. And for the optimization whiz, go ahead and set up a bunch of marketing experiments. Testing is the best way to identify customers likely to generate organic demand!! What Kind Of Data Would I Need For The Competitive Co-Op Multichannel Forensics Analysis? Ok folks, here's what you need to tell your co-op to send to me, if you are interested in understanding the impact your competitive set has on your business. Data Requirement: A .csv file with two years of summarized purchase activity. Column B = Year (2007 or 2008, for example). Column C = Description of competitive-set, or your business. Column D = Annual Demand. How the loyalty of your business is impacted by changes in customer behavior at competitors. Where new customers come from. The impact your business has on competitors. The long-term trajectory of your business, compared with your competitors. The impact customer acquisition has on your business and competitors, as well as customer loyalty / retention. See if your co-op provider will provide you with this analysis. If they won't do that, see if they are willing to send anonymous data to me. If they won't do that, ask them why they won't help you!!!! With my Nordstrom Visa, I earn $20 Nordstrom Notes every time I spend "$x" at other retail stores, or when I fill up the car with gas ... an expensive proposition last summer. Today, I cashed in $80 of Nordstrom Notes on two shirts --- total cost, with tax, was $80.01 --- one of the shirts was about 60% off. It is an interesting transition ... going from being an apparel merchant to giving me free merchandise for the right to harvest money from my transactions with Shell, Olive Garden, Kohl's, Apple, and my annual physical co-pay. When we conduct the post mortem on the death of retailing (2003 - 2008 edition), we'll want to create a few powerpoint slides on this topic. Overlaying co-op attributes on your customer file is a common multichannel marketing best practice. Maybe you have a housefile segment that is expected to spend $1.50 per catalog. The cataloger matches the names in the segment to their favorite co-op subsegment, dividing the list into matches and non-matches. In theory, matches will perform at $1.75 (mail these names), non-matches will perform at $1.25 (do not mail these names). Co-op information is typically used for targeting purposes. Co-op information is seldom used for strategic purposes. That's a shame, folks. See if your co-op will do this for you. Have your co-op determine a "competitive set", a group of a half-dozen companies that directly compete with your brand. Have your co-op determine a "non-competitive set" of a half-dozen companies that indirectly compete with your brand --- these companies are not your competitors, but your customers love to shop with these companies. Now that this has been done, have your co-op perform a three channel Multichannel Forensics analysis for 2007 and 2008, projecting future sales for 2009 - 2013 given the trends of 2008. You'll get to see how changes in competitive and non-competitive brands are directly influencing the future trajectory of your brand. You'll get to see if your customers are defecting to the competition, and if so, you'll get to see what impact defection has on your future sales trajectory. If your co-op won't perform the analysis for you, see if they will put together a dataset with anonymous information that they'll send to me, so that I can do the analysis for you --- or so that you can perform the analysis yourself. Partner with the co-ops to obtain strategic insights into how your competition impacts your business! Our metrics continually lie to us. Some are so easy to debunk ... "Multichannel Customers Are The Best Customers". Some are much more complex. 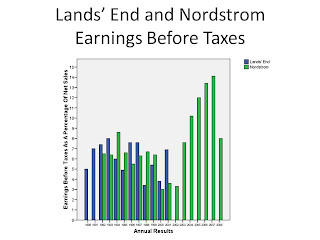 Back in 1993, Lands' End was caught up in the "targeting" movement. In other words, the core monthly catalog was not driving large enough sales increases to please management and shareholders. As a result, management chose to create specialty catalogs, targeted to customers who previously purchased niches of product. What was once a catalog strategy that yielded thirteen catalogs, one every four weeks, became a catalog strategy that offered some customers thirteen monthly catalogs, nine Kids catalogs, nine Home catalogs, six Mens Tailored Merchandise catalogs, four Womens Business Merchandise catalogs ... you get the picture. On the surface, the specialty catalog, the one targeted to prior customers of various merchandise assortments, performed well. This didn't sit well with some of us. So we created year-long tests, where some customers did not receive specialty catalogs. At the end of the year, we learned that one of the specialty businesses, if terminated, would hand sixty percent of the business back to the core monthly catalogs. In other words, the specialty catalog was cannibalizing the core catalog ... making the core catalog look bad, from a performance standpoint. We worked with the finance department to re-state the profit and loss statements. Look at the difference a 60% cannibalization rate creates. This profit and loss statement is one that reflects actual customer behavior. The targeted specialty catalog is truly only adding $8,000,000 of incremental volume, and is actually losing $1.9 million a year. Needless to say, this information was not well received. But the information represents the truth. We're so quick to believe the metrics we read every day that we seldom question them. "Oh, this landing page had a 6.3% conversion rate, that's good, that must have worked!!". It is possible that something else caused the landing page to work, that the landing page itself wasn't successful, but that something we aren't measuring caused the success? We learn that our metrics are wrong when we operate in a "testing culture". A testing culture demands that we ask questions, that we develop hypotheses, and that we test our hypotheses. All of the magic happens when different strategies are tested. The KPI/Dashboard maven is right to want to create nine important metrics that dictate success --- most employees struggle with multidimensional issues and complexity. But if you are reading this, you are not like "most employees". You are different. You are curious. You do not accept the version of truth the trade journals, bloggers, vendors, or consultants paint for you. Truth isn't illustrated by a metric. Truth is multidimensional, and is always available to those who seek it. With Data Analyst Day less than three weeks away, you're probably already thinking about the gift you are going to get your favorite data analyst. As you already know, Data Analyst Day is the third biggest gift-giving holiday of February, behind only Valentines Day and Presidents Day. Here is a top-ten list of gift ideas for the Data Analyst in your life. Number 10 = iPod Classic, at Best Buy. The honest truth is that your data analyst wants to listen to her iPod with earbud headphones, mostly because she doesn't want to be distracted by last-minute requests to create KPIs that summarize Shopping Comparison Site performance. If you are an Executive, pay close attention to your data analyst --- do the earbud headphones go in every time you approach to ask a question? Number 9 = Notebook Computer with Horsepower, from PC Connection. There is nothing more demeaning to the data analyst than being required to use the same desktop computer purchased during the go-go days of the internet bubble. Granted, the legal folks hate it when data analysts are given laptops with critical company data --- you never know when the laptop will be stolen from your car while enjoying after-work drinks and appies at Red Robin. Nevertheless, a notebook computer with dual processors tells the data analyst that the company cares about her. Number 8 = Neural Network Software from Advanced Software Applications. Sure, complex analysis can be done in Excel, or in a free tool like Google Analytics. That being said, your data analyst is tired of "setting up goals", or calculating sales tax for orders in Idaho. She wants to do something creative, innovative, something nobody will ever be able to adequately explain to an Executive. Neural network technology is perfect for this! Number 7 = HP 7250 Wireless Printer from Amazon. Your information technology department doesn't see anything wrong with the 1995 black-and-white, four-page-per-minute laser printer located in your cafeteria --- it still works!! But your data analyst wants to be inspired, and wireless printing is one way to inspire an analyst. A key point, folks ... this printer isn't for everybody. Even though anybody could, in theory, print wirelessly to this unit, your data analyst wants sole use of the wireless printer, and wants the wireless printer in her cube. Number 6 = Glossy Paper from Office Max. When you're getting ready to print a pie chart, you want the confidence of knowing that "magenta" slice is going to look the way it looks on the screen. This is best accomplished by having an ample supply of glossy paper. Number 5 = Open Office Software Suite from Sun Microsystems. Your data analyst and your finance department will love you for this gift --- heck, it is FREE! Most important is the fact that the data analyst can create documents, spreadsheets, and presentations using odd extensions. This helps the data analyst gauge the technological sophistication of the recipient of the document --- to the data analyst, it is big-time fun to be able to say to an Executive "You mean you don't know how to open a .ODS file?" Number 4 = 32" 1080p Samsung Monitor from Newegg.com. Business leaders frequently overlook the importance of computer monitors. After all, you can still do your job using one of those old CRT monitors from the 1980s, the ones that have green-on-black or orange-on-black screens. The data analyst knows that a 32" 1080p monitor conveys credibility. Nobody wants to learn about the details of the hyperbolic tangent function on a small screen. Number 3 = Presidential Tufted Executive Leather Office Chair from BizChair.com. A data analyst requires comfort and back support. Both are sorely missing from today's array of standard, $170 office chairs with mesh seats. Why not spend a little more, and provide your data analyst with a chair that adequately conveys your appreciation for the "Top Ten Referring URL's" powerpoint slide she created for you last week? Number 2 = Vintage Gas Pump Liquor Dispenser. Your data analyst may have grown up watching "Dallas" on Friday evenings. If so, she learned about the importance of alcohol in the workplace. If there was a problem at a refinery, Bobby & JR solved key business issues in JR's office with a glass of hard liquor in hand. Your data analyst probably suffers productivity issues when required to purchase Fanta soft drinks from the vending machine. Number 1 = T-Bills. Why not give each data analyst at your company a $100,000 security direct from the U.S. Treasury? Your employee will thank you, your government will thank you, and the money you spend will be immediately re-distributed to financial institutions all across America. Data Analyst Day: February 2, 2009!!!!!! Economy got you down? Layoff pending? Tired of going to work and seeing -18% on the comp store sales report, or tired of seeing e-commerce sales at -3% every day? Let's start the new fiscal year on a good note! Today, I am formally announcing a new holiday. Monday, February 2 will be "Data Analyst Day", a world-wide day-long celebration of all that is good in the world of data analysis! Maybe you are an Information Technology expert who just worked a weekend to create a dashboard for your Executive team. Maybe you are a Business Intelligence staffer who recently used Business Objects to prove that certain store employees are worth 20% more than others. Maybe you are a SAS/SPSS Programmer who calculated the lifetime value of multichannel customers. Maybe you are a Web Analytics professional who demonstrated that branded search terms have a 15% larger average order value than other search terms. Maybe you are a Catalog Circulation manager who saved your company $1.2 million dollars in expense by trimming unprofitable customer acquisition names. Maybe you are an E-Mail Marketing director who developed six customized, personalized versions of a campaign that delivered a 20% improvement in $-per-e-mail. Maybe you work in a fulfillment center, and you saved your company $300,000 in efficiencies, and you did so without touting yourself to Sr. Management. Maybe you work at a Catalog Co-Op and you anonymously made your clients $3.5 million in profit by targeting the best names available. Maybe you work in Online Marketing, and your portal advertising strategies caused a 4% increase in website traffic on the same ad-spend as last year. Maybe you work at Catalog Choice, and your analytical efforts helped influence catalogers in a way that saved 222,000 trees last month. Maybe you work at a Social Media startup, and you proved that certain users are "uber-influencers" who deserve special treatment. Maybe you just deserve some recognition! No matter the job or reason, you all work hard to analyze data to help your company succeed, or to help customers get more targeted communications. You deserve a day just for you! If you have any great stories or bios of data analysts who made a difference, forward them to me in Microsoft Word or E-Mail or .PDF format and if I get a suitable quantity of good nominations, I'll publish a "top 50" or "top 100" list on February 2. So SPREAD THE WORD --- February 2, 2009 is a world-wide event --- it is Data Analyst Day, celebrating all that is good in the world of Analytics!!! !